Welcome to The Abso!ute Sound online! We explore music and the reproduction of music in the home. We believe that the sound of music, unamplified, occurring in a real space is a philosophic absolute against which we may judge the performance of devices designed to reproduce music. Our goal is to provide the resources consumers need to judge how a component's sound either honors or departs from the music's truth, and to make sound purchasing decisions that maximize their experience of reproduced sound. Below is our Issue 180, March 2008 contents and editorial. High-end audio in China. Robert Harley reports from the Guang Zhou show. 29 In the age of the iPod and downloadable music, vinyl records just keep on going. In this issue we focus on LP-playback gear and select new LPs, with a side-trip into mono and, for you bit-heads, a look at how to digitally archive vinyl. Wayne Garcia looks at three turntables to get you started in analog. WG reports on new reissues of iconic jazz LPs. Steven Stone shows you how to make a digital archive of your LP collection with the Korg MR-1000 DSD recorder. WG on two great phonostages from Canada's Simaudio. Jim Hannon on a mid-priced 'table from Germany with a magnetically levitated platter. Shelter's new moving coils outperform their highly praised predecessors-and for less money-says Chris Martens. The monophonic cartridge is making a comeback. Jacob Heilbrunn evaluates four models-the Grado Prestige MC+, Dynavector XV-1s, Air Tight PC-1, and Lyra Titan. For the budding monophile, Mark Lehman and Jonathan Valin list some worthy mono LPs. Paul Seydor discovers a lot to love in Basis' mid-line offering. JV on a superb, handmade, three-motor turntable from Germany. 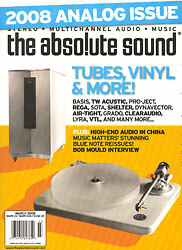 JV on a great moving coil and the world's most convenient record-cleaning machine. Want to remove ticks and pops from LP playback? WG on a device that claims to do just that. Anthony H. Cordesman on an updated Harman-Kardon Citation power amp and preamp from the Age of LPs. JV auditions a first-rate hybrid-electrostatic priced under $2k. Neil Gader on a tubed tuner for XM Radio. Jacob Heilbrunn on VTL's flagship tubed amplifier and preamp. Robert Harley on an atomic-clock that makes a great CD player even greater. Plus: A short history of jitter-what it is and why it matters. 132 Harry Pearson evaluates an ambitious loudspeaker from a new company called Scaena and previews the VTL Siegfried amp. We speak with singer-songwriter Bob Mould and review his latest album as well as new CDs and LPs from the Magnetic Fields, the Mountain Goats, Chris Walla, Cat Power, Rufus Wainwright, Shelby Lynne, Jesse Dayton & Brennen Leigh, Antietam, and Vampire Weekend. Plus, a box of Atlantic soul and vinyl from the Dillinger Escape Plan, Menomena, Radiohead, Sharon Jones, GhostfaceKillah, Rush, Santana, and Simon & Garfunkel. Golijov's soundtrack for Youth Without Youth, Handel's Solomon, Dallas Wind Symphony's Crown Imperial on Reference, the Tokyo String Quartet's Beethoven String Quartets, Op. 18, and an audiophile LP reissue of the Brahms Second Piano Concerto from Cisco. Plus, the debut of the Multichannel Marvels column. Coverage of hot releases from Maceo Parker, Out to Lunch, Ari Brown, Nicole Mitchell's Black Earth Ensemble, Pat Metheny, Free Form Funky Freqs, Catherine Russell, Lizz Wright, and Horace Silver. Plus, a Coltrane book review. 184 We talk with Eli Gershman, Founder and Designer, Gershman Acoustics.